Israel has expressed “deep concern” at a political breakthrough by an extremist party in Ukraine that is well known for its attacks on Jews and foreigners, and which managed to win a large number of parliamentary seats for the first time on Sunday thanks to an election pact with controversial opposition leader Yulia Tymoshenko’s Fatherland Party. The opposition was also boosted by the tacit support of Secretary of State Hillary Clinton. 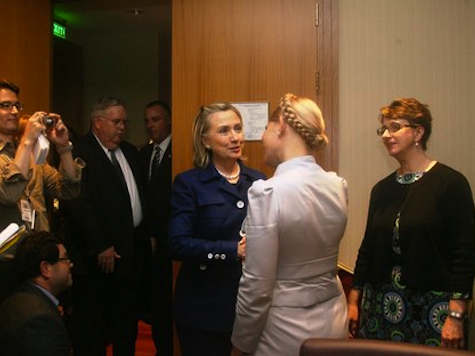 Mrs. Clinton last week penned an op-ed in The New York Times praising Mrs. Tymoshenko, who in turn joined forces with the anti-Semitic Svoboda Party. On Sunday, Tymoshenko’s opposition party ran in an election alliance with the extremist Svoboda Party, which for the first time broke through the 5% minimum vote barrier, achieving dozens of seats; all in all, Svoboda received around 11% of the national vote according to exit polls. That silence continues from the State Department with regard to Ukraine.